High-speed camera systems are a well-established alternative to traditional vibration measurement techniques, particularly in cases when the region of interest on the observed object is near-planar. With the introduction of 3D digital image correlation some of the traditional limitations of 2D imaging systems are eliminated, but the limited field of view of stereo camera pairs remain problematic in some applications. 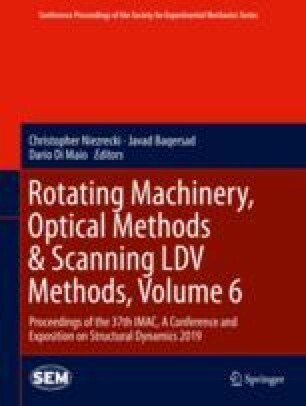 In this paper the possibility of extending the use of high-speed camera systems to vibration measurement of arbitrarily shaped structures by applying methods, commonly used in multi-view computer vision is explored. A single high speed camera is used to record the vibrating structure from multiple points of view. By utilizing properties of linear, time-invariant mechanical systems, multi-view triangulation is then performed in frequency domain on displacement data, extracted from these image sequences using optical flow or digital image correlation. The acquired 3D spectra are finally used in full-field deflection reconstruction.